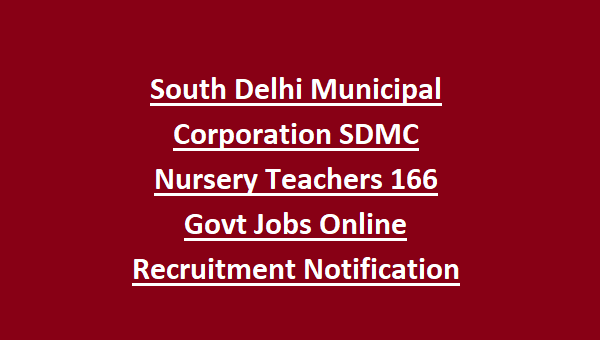 There are total 166 Nursery Teacher Jobs available in SDMC Recruitment 2018. For General candidates age limits are 18-30 years, for OBC candidates upper age limit is 33 years and for SC/ST candidates upper age limit is 35 years. Must have qualified 12th class with 45% and Diploma in Nursery Teacher Education Program of 2 years or B.Ed Nursery. Selection Process for SDMC Nursery Teacher Vacancy Recruitment 2018 :. Candidates selection for these Nursery Teachers jobs will be based on academic qualifications merit and documents verification. A short list will be prepared based on candidates marks in qualifying exams and those candidates only called for documents verification. Online applications only accepted for this SDMC Nursery Teachers jobs till 14-08-2018. Official website to apply online is www.mcdonline.gov.in. 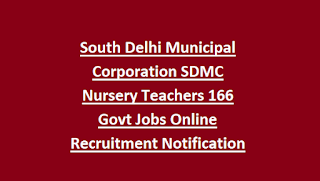 Download Notification here for NurseryTeacher jobs of SDMC Schools.